The Middle Ages was a period of approximately 1000 years of history; generally accepted as spanning from the fall of the Roman Empire (toward the end of the 5th century) to the Protestant reformation in the 16th century. This period began with a demographic downturn at the end of the Roman imperial era, with European populations shrinking and many cities and rural estates abandoned. A cooling climate, disease, and political disorder each played a part in this opening period which saw Classical Mediterranean civilization eclipsed. Across Europe, there emerged smaller, more localized hybrid societies combining Roman, Christian and Germanic or Celtic barbarian influences. By the 9th and 10th centuries, populations had reached their minima, and Europe became a largely rural and somewhat backward region. Commerce and learning flourished in the Islamic world, China and India during this the same period. Islamic armies conquered Spain during the 7th and 8th centuries, but were defeated by the Frankish kingdom in 732 when they attempted to enter France. The turn of the first millennium saw renewed growth and activity, as kings and cities consolidated their authority and began to repopulate lands left empty by Rome's decline. Warmer weather after 900 allowed more land to be brought into food production. The feudal system of agriculture, where peasants were tied to their estates by obligations to local lords or to the church, provided a degree of economic stability. This was aided by the arrival in Europe of the horse collar from Asia, which increased crop yields by allowing plows to be drawn by horse, rather than by slower oxen. Commercial towns flourished in England, France and the Low Countries. German rulers dispatched monks and peasants to clear forests and settle in Eastern Europe and the Baltic regions. The city-states of northern Italy rose in wealth and influence. Islamic Spain became a center of learning and culture where Christians, Muslims and Jews coexisted in relative amity. Despite many local wars and disputes between knights, the High Middle Ages, from 1000-1250, saw growing populations and prosperity enough to build great cathedrals and send European armies abroad on crusades. After 1250, demographic stagnation emerged. Population growth slowed or stopped as the limits of medieval agriculture were reached. Major conflicts between powerful kingdoms, such as the Hundred Years' War between England and France, became more frequent. The Christian church, previously secure in its spiritual authority, was racked by schisms and increasing financial corruption. The year 1348 saw a catastrophe as the virulent bubonic plague (the "Black Death"), entered Italy, carried by ships from Asia. It spread across the continent over three years killing, by some estimates, one-third of all Europeans. Many believed it was the end of the world foretold by Christian myth. Along with its suffering, the plague wrought economic havoc, driving up the cost of labor and making the old feudal system untenable, as surviving peasants scorned its demands. The following century and a half transformed Europe from a patchwork of feudal fiefdoms, under loose royal and church control, into a collection of newborn but increasingly unified national states. Towns became centers of resistance and dissent to the old royal and church authorities. Former noble and knightly influence declined, and rulers realigned themselves toward the increasingly wealthy and influential burgher and merchant classes. Emergence of the printing press and spreading literacy, increased religious and political conflict in many countries. By 1500, Christopher Columbus had sailed across the ocean to the New World, and Martin Luther was about to take much of Europe out of the orbit of the Roman church. These developments opened the modern era of history, and brought the Middle Ages to their true end. A number of modern institutions have their roots in the Middle Ages. The concept of nation-states with strong central governmental power stems from the consolidation of powers by some kings of the Middle Ages. These kings formed royal courts, appointed sheriffs, formed royal armies, and began to collect taxes - all concepts central to modern government. A leading example was the French kingdom, ruled by the Capetian dynasty from 987 until the early 14th century. French provincial nobles and their castles and knights were brought under effective royal control during this time, and national unity benefited. Conversely Germany, which had strong kings in the 10th and early 11th centuries, suffered a series of political conflicts during the High Middle Ages between rulers and the Church, which weakened national cohesion and elevated regional lords to great influence. During the Middle Ages, Kings originally called Parliaments to explain their policies and ask for money. Parliaments at this time represented the three collective estates - the clergy, nobles, and merchants - not individuals. The idea of limited government also arose, challenging the traditional notion at the time that rulers were all-powerful (such as a Roman emperor or an Egyptian pharaoh). The most substantial occurrence was in 1215, when the nobles of England asserted their rights against King John in the Magna Carta. In addition, the notion of parliaments, as explained above, came into existence, and the reciprocal nature of the feudal and manorial contracts laid the most basic groundwork for the concept of the social contract. In addition, the formation of governmental bureaucracy began during this time, as the royal councils of medieval kings evolved into modern government departments. Finally, the regulation of goods and services became increasingly prominent during the Middle Ages, as guilds protected the consumer from poor products. Thinkers of the Renaissance and the Enlightenment tended to look at the Middle Ages with scorn, but the Middle Ages were essential in laying the groundwork for the times to come. Both painting and literature received a new burst of life as the Early Middle Ages came to an end. Giotto began to express the Human form more realistically. Although his forms seem primitive compared to those of the Renaissance artists, he was the first to attempt to bring back the realism of Roman art. He also began to develop techniques of perspective in paintings to achieve depth. Most of his art was in the form of plaster-based frescoes on the walls of chapels and churches. As the prestige of the Papacy began to decline, national consciousness began to increase; this nationalism was manifested in literature written in national languages, or vernacular, instead of traditional Latin. This use of the vernacular opened up such that cultural peculiarities could be more naturally expressed. This allowed literature to feel more realistic and human to the readers, and is why pieces such as The Canterbury Tales are considered depictions of life in the times in which they were written. While the literacy of laypeople increased as a result of increased vernacular writings, society was still largely based on oral culture. Dante Aligheri was born in 1265 in Florence, Italy. His family was not rich but was considered an aristocratic line. He was taught by Brunetto Latini, who trained him in the classical liberal arts, including Latin and Greek. 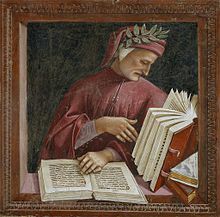 Yet, Dante set out to embrace his vernacular language and began to write The Divine Comedy in his local Tuscan dialect. Today he holds a place in history as the first author to do so. Alighieri considered his work a comedy due to the differences between his Italian writing style and the great Latin tragedy. His three-part epic poem sarcastically criticized the Church and commented on a variety of historical and contemporary individuals. The most important of these figures is Virgil, the Latin poet, who plays the role of Dante's guide through the afterlife. Dante's personal feelings towards many people are also evident in his writing. In the deepest layer of hell he punishes those for whom he personally had the greatest disdain. Much of this personal disdain came from his position as a politician in Florence. One of the victims of his deepest layer of hell is Boniface VIII, a pope whose political policy of expansion he opposed. Each of the poem's parts portray degrees of salvation, with "Inferno" being Hell, "Purgatorio" being Purgatory, and "Paradiso" being Heaven. Inferno includes many of the archetype depictions of hell including the River Styx, and the ferry man Charon who carries people across the river. Chaucer's The Canterbury Tales, a collection of stories, exposed the materialistic, worldly interests of a variety of English people. This collection of stories was set in a frame based around a trip to Canterbury as a pilgrimage to the shrine of Saint Thomas Becket. The stories are the individual tales of thirty people making this pilgrimage. The accounts range from romance to family to religion, providing a cross section of society at the time. A large percentage of the populace, and therefore a large percentage of the characters, seemed more focused on material pleasure than on their eternal souls. The Canterbury Tales is also useful as a study of English vernacular at the time. It is a classical example of Middle English that linguists and those studying medieval and early modern England continue to use to this day. The Hundred Years War was a very complex war, fought between France and England (with the occasional intervention of other countries), over three main conflicts. In particular, the nations fought over control of the Gascony region in France, rebellions supported by Britain in French cloth production towns, and English claims to the French throne after the death of Charles IV. The war, initially sparked by a dispute over who would become King of France after the death of King Charles IV, quickly became an amazingly complex and multi-faceted war. King Edward III and his son Edward, commonly known as "The Black Prince", invaded Aquitaine, a huge region in southwest France claimed by England. As time went on, the Kings of England and France involved themselves in many more operations, ranging from a civil war in Brittany, trade disputes in what became Belgium, even a war in Castile. The three major battles of the Hundred Years War, Crecy, Poitiers, and Agincourt, were resounding English victories, the flower of French nobility being cut down at every battle. However, even though the English won every major battle and many of the smaller ones, relatively poor England was never able to subdue southern France, by far the wealthiest portion of France, which eventually led to the English losing the war. From the 6th to 10th centuries, there were few commerce centers and only small merchant classes in Europe. What long-distance trade there was usually focussed on luxury goods for the nobility and church elites, and was mediated by traveling merchants such as Syrians or Jews. Crafts were carried on locally in manors. Populations were not large enough to support further economic developments, and Viking and Arab attacks made trade routes hazardous. During the High Middle Ages of 1000-1500, long distance trading became safer and thus more profitable. As a result, craftsmen moved into growing centers of trade, forcing lords and serfs to have to get their goods from these centers of trade. Towns formed leagues and urban federations, or communes, that worked together to fight crime or deal with monarchs and nobles. Guilds also arose, allowing for the collective supervision of affairs - the work was done by reliable people, and the guilds provided for vocational education. The spirit of the medieval economy, however, was to prevent competition. The rise of towns had an emancipating effect. They forced the lords to offer freer terms to the peasantry. Often, peasants earned freedom in return for an annual payment to the lord. Allowing large numbers of people to move from agricultural to industrial work in the towns brought economic acceleration. Indeed, a sort of handicraft industrial revolution took place during the 12th and 13th centuries, especially in the Low Countries where great cloth-making centers such as Ghent and Bruges accumulated much wealth and stimulated growth in Western Europe generally. The Hansa, a widespread league of North Sea, Norwegian and Baltic trading towns, emerged in this period, opening up Scandinavian resources to supply Western Europe with furs, timber, beeswax, and fish. The High Middle Ages also saw Europeans returning from Crusades in the Middle East, where they had developed tastes for goods not produced at home. These homecomings introduced medieval Europeans to exotic spices, silks, fruits, drugs, and other eastern products for the first time. Cities around the Mediterranean took part in the trade that developed, with Venice becoming the richest port of entry for Asian goods, the base from which Marco Polo and his companions set forth on their journey to China. During this same time period, the monarchies began to grow, and as a result people began to see the formation of unified nation-states. Kings sent executive orders and began to institute royal courts, and they lived off of money from the manors that they owned and fees from their vassals. The king's royal council was a group of his vassals that advised him on state matters, which resulted in the formation of basic departments of government. When representatives of towns began to meet, this was an early formation of basic parliaments. These parliaments didn't have the ability to dictate to the king, but could state grievances and the king could act upon them. This was a basic sort of legislation. In addition, the formation of these parliaments led to the establishment of the three estates: the first estate, which was encompassed by the clergy; the second estate, made up of the landed and noble class; and the third estate, or the burghers of chartered towns. England had two houses of parliament - the House of Lords and the House of Commons. The House of Commons allowed lesser landholders to become members. Spread of the Black Death in Europe. Black Death, or Bubonic Plague, hit Europe in 1347. Transmitted primarily by fleas and rats, the bacteria Y. Pestis swept across the continent, killing one third of the population by 1351. The bacteria is thought to have been endemic among rodent populations on the Asian steppes, and jumped to humans in Europe with great virulence. The onset of the disease was sudden; the symptoms were fever, weakness, delirium, lung distress, and dark-colored swellings (buboes) in the neck, armpit and groin areas. Quite often, those infected died within 1-2 days, including young and previously healthy individuals. The revival of trade and commerce increased the potential for the spread of communicable diseases. Europe had not suffered a continent wide plague since the plague of Justinian in 535, and the unexposed populations of 1348 had no inherited immunity. Though prosperity had risen, nutrition and sanitation for most Europeans were very poor by modern standards, decreasing immune resistance in general. Many adults had also suffered as young children in the Great Famine of 1316-1321, when several years of cold and wet weather caused crops to fail across the continent. This experience in childhood may also have compromised their resistance to the plague bacillus in later life. The plague is thought to have been brought to Europe during a Mongol attack on Kaffa (in the Black Sea); when sickness forced the Mongols to abandon their attack, they catapulted a few plague victims into town before leaving. Ironically, this became a common practice for Europeans in castle siege. From there, merchants spread the disease to Constantinople, where it propagated throughout Europe, first by ship to Mediterranean ports such as Messina and Genoa, and then by land in all directions. A shortage of wood fuel, due to cutting of forests for agriculture, resulted in the shutting down of bath houses which relied on burning wood to heat the water. Particularly in winter, only the rich could afford to bathe. This further contributed to poor hygienic conditions. Cities were also very poorly designed for hygiene. Citizens commonly dumped waste into the street which attracted rats, and thus fleas. Living in cities was also very close, which meant that fleas had little area to travel to infect another person. The plague was blamed on many things in particular the Jews were a common scapegoat for the plague, including city leaders claiming that members of the Jewish community had poisoned the water supply, or spread a poisonous salve on the gates of the city. It is important to understand that Europeans did not understand the real cause of the plague. To them the plague was a curse brought on them by their lack of piety, or the failings of the church, the cities' Jewish population, or even the configuration of the stars. Others even attributed the plague to bad air. To combat it, they carried kerchiefs or bags of "aromatics" that they could hold to their noses as needed. (The opinion of Europe's leading medical faculty, at the University of Paris, was that the outbreak was brought on by an unfavorable astrological alignment in the year 1345). Lacking the real facts, many Europeans' attempts to quell the disease actually helped it spread. Some people thought the plague was punishment by God against sinners. The flagellants arose as a result. Flagellants whipped themselves to bleed, prayed for mercy, and called upon their congregations to repent sins. Wandering over plague-stricken central Europe, many groups of flagellants turned to banditry and violence. Towns and feudal lords eventually prohibited them or even tried to wipe them out. In addition, violence against Jews broke out, and mobs killed all who refused baptism. Many Jews were forced to flee their homes. Physicians in medieval Europe used a mixture of trial-and-error methods and classical Greek or Roman sources to care for their patients. Without knowledge of microorganisms, or the role of rats and fleas in spreading the infection, doctors were unable to cure infected victims or limit the spread. As a result, plague sufferers survived or perished according to the general state of their health, and whatever genetic resistance they happened to possess. Massive death opened the ranks for advancement in society, and as a result landlords made more concessions to obtain new tenant farmers. The supply of laborers plummeted, resulting in higher wages for workers. A low grain demand resulted in the drop of overall grain prices. Noblemen lost a portion of their wealth, and became more dependent upon monarchs and war for income and power. Additionally, the plague resulted in the improvement of living standards for the peasantry and the urban working population. Peasants and artisans now had more luxuries and a better diet, and production shifted from manufacturing for a mass market to a small luxury market. However, the monetary disparity grew, as fewer people possessed proportionately greater money. Finally, Europeans saw that the church's prayer did not cure the plague, and that even leaders of the church were dying. This caused the general populace to lose a great deal of faith in the church, and opened the door to many new and local religious movements which had previously been suppressed, a factor which helped prepare the coming of the Reformation a century later. The Middle Ages provided many foundations to the Reformation of the 16th century. During the time, the church provided order, stability, and a framework for the medieval world. The most essential foundation of medieval life was salvation - and the ultimate life goal of all people was to obtain salvation. As people lost faith in the church and its ability to provide salvation, the church began to lose its hold on the populace. As explained earlier, the plague contributed to the people's loss of faith in the church. However, some more ardent believers would have regarded such a plague as being sent from God to punish the world for its sins. The church of the day would have played upon such a notion so as to encourage more ardent belief and to attack any dissenters. A number of movements and people challenged the authority of the church during the end of the Middle Ages. The free spirits believed the church was not meeting the spiritual needs of the people, and advocated mysticism, or the belief that God and humans are of the same essence. John Wycliffe, an English priest and professor at Oxford, founded the Lollard movement. The Lollards argued that salvation didn't have to come through the pope, and that the king was superior to and more important than the pope and religion. He said that Bible reading and prayer were important to religion, not the interpretation by priests. He was one of the first to set out to translate the Bible into a vernacular language rather than using the Latin Vulgate. He also objected to the extreme wealth of the church and clergy. Jan Hus, by forming the Hussites, attempted to bring about reforms like those attempted by Wycliff in England. Hus was a priest in Bohemia when he learned of Wycliff's teachings. While the people around him thought them heretical and forbade them, Jan thought they had a right to be taught. Through his various disagreements and dealings, Hus came to think the church corrupt, and left his native land to pen On the Church, a work which criticized the manner in which it was run. His teachings appealed to the masses, and he developed a group of followers known as Hussites. In 1413, Hus was invited to a council designed to reform the church, but when he arrived he was arrested for his views. The following trial was in many ways just a formality, as he was guilty the moment he stepped in. Hus was burned at the stake on July 6, 1415. The vast corruption in the church also led many to doubt and question its authority. The excess wealth of clergy and the frequency of clergymen having mistresses and illegitimate children was a major concern. The people also questioned the church's sale of indulgences, or receiving payment to forgive people of their sins; nepotism; simony, or the sale of church office; pluralism, or holding multiple church offices; and the extreme luxury of cathedrals. Allegiances during the Great Schism of 1378. In 1305, the King of France invited the Pope to move the headquarters of the Church away from Rome, a city plagued by warring local factions, to Avignon in the Rhone Valley. After Pope Gregory XI's return of the papacy to Rome in 1377, elections were convened for a new Pope. The citizens of Rome, demanding the election of an Italian Pope, forced the Cardinals to elect Urban VI. Dissenting French Cardinals reconvened in Avignon and on their own elected their own pope, Clement VII. The French popes of the Great Schism, referred to by historians as antipopes, held papal power in some regions of Europe, and for 39 years there were two Popes. In an attempt to reconcile this Schism, Conciliarists held a conference at Pisa to elect a new Pope, but could not depose either of the two in power, resulting in a threefold split in the papacy. Not willing to give up, the Pisan convention elected yet another Pope, to the same result. Finally the Council of Constance (1414-1418) stepped in and called for the abdication of the three popes in power. With the support of the Holy Roman Emperor, the three popes were deposed and Martin V was elected as a single pope, ending the Great Schism. The Council of Constance also took action against John Wycliffe and John Huss, two reformers within the Catholic Church. Trang này được sửa đổi lần cuối vào ngày 2 tháng 11 năm 2013 lúc 05:59.